One of the first lessons we did revolved around digital story telling. At our school, we use Character Counts. Students had to choose a person who they believed displayed one of the characters from the six pillars. They wrote a story about their person and explained how that person showed one main trait in their daily life. Next, students took pictures of the person, brought in CD's, scanned pictures, or got pictures from the internet to place in an iMovie. Students used iMovie to make a movie of their person. 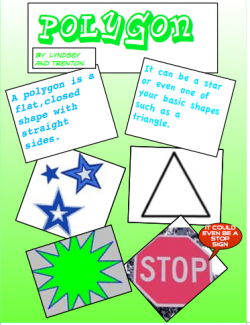 Students used comic life to create a vocabulary math page. Then the pages were bound together to create a class book. Here are some examples of pages from the book. Students will learn how to use the number line, compare integers, order integers and understand the vocabulary. Begin with the Discovery Streaming video http://mathstar.lacoe.edu/newmedia/integers/intro/activities/intro_numberline.html. Only show the first section of this video. Next students will take turns using the Promethean board to come up and work through the number line activities, on the website, http://mathstar.lacoe.edu/newmedia/integers/intro/activities/intro_numberline.html. The rest of the class is watching and helping as needed. Next students will practice ordering integers independently on the website, http://www.mathplayground.com/numberballs.html. This has sound so you might want to turn it down. Students really have fun with this so limit the time or the number of games they can play. Then students will go to the website, http://www.ixl.com/ to practice using a number line (C3) and ordering integers (C4). After students have completed 20 of each type of problem, they can move onto the quiz. If you do not have a subscription to this site, students can work 10 of each problem. IXL will give you 20 free problems per day. The assessment is the on-line quiz from the Glencoe textbook, http://glencoe.com/, Chapter 11 lesson 1 quiz. Record the score as students finish. As students are working the teacher needs to move around the room answering questions and compliments students as they work. Students will practice graphing, rotating, reflecting and translating triangles and quadrilaterals in all four quadrants. Using the flipchart: Tranformations.flp, discuss the vocabulary on the first page and make sure students understand the three different transformations. The teacher will then model the first example for translation while students are do the same thing at their desk with graph paper. Discuss the process as you model and make sure students all have it done correctly. Then on the following 3 pages chose a different student each time to come up to the Promethean board to model. All other students are practicing at their desks. Teacher moves through the students checking for understanding and helping fix mistakes. I also pick one student from each table group that I check and if they have it correct then they can help others at their table that need help. Review again using the same flip chart, but only practice one of the pages, then assign matching problems from the textbook. Class time is used to complete the assignment and teacher can again move through room to make sure students are understanding. Repeat from Day 1 only this time do reflection. Repeat from day 2 with the assignment for reflection. Repeat from day 1 only this time to rotation. Repeat from day 2 with the assignment for rotation. A fun activity for the beginning of the year is for students to create goal posters. We had students use the digital cameras to take pictures of something in nature that expressed themselves. 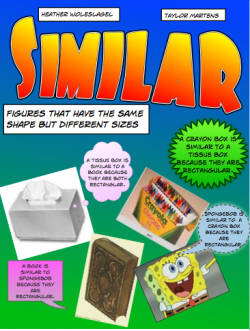 Using Pages, students uploaded the pictures to a poster size document (11in.x14in. ), wrote three goals for the year, and found a quote on the internet that they liked to place on their posters. Students took one poster home and one poster was placed in the hallway at school to help them remember their goals throughout the year. This will aide their understanding of the characters in a story. These directions were given to students: Open the program Inspiration on your computer. Click on the Diagram. Using the circles, type the name of the character and a brief description of who the character is. Make as many circles as there are characters in the book. Save your work in the document's folder. Add more characters to this as you read the book. Also, refer to it when you have questions about the characters. This will be a handy tool for you to use in keeping the characters straight. Students created a Public Service Announcement by using Garageband. Working in pairs, students wrote a PSA about tobacco prevention. Then they recorded their announcements using voice inflections as they read. This lesson focused on writing skills, science, and reading fluency and rate.